We are honored to announce The Garage in Pelham as our Platinum sponsor for 2019. The Garage has supported Grace Klein Community for the past 4 years. We take our GKC vehicles and employee vehicles to The Garage AND we recommend using The Garage for all of your service needs. The Garage believes in creating relationships built on trust with each of their clients. Giving back to the community is also a priority at The Garage. Every month they select a different non-profit charity. Grace Klein Community is blessed to be the charity for March!! Knowing The Garage is stepping out to invest in our organization, we are believing God to give them back double what they have shared with us. We cannot wait to hear how fast God does that!! 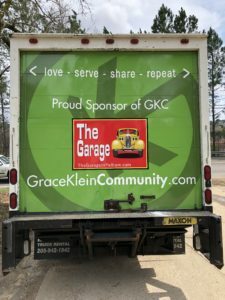 We value the partnership we have with The Garage and their decision to be a sponsor of Grace Klein Community as we join together to advance the Kingdom of God. 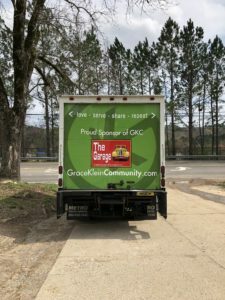 We are so excited The Garage is our Platinum sponsor – which includes our box truck sponsor and sponsorship for all our 2019 events. “Giving back to our community has been a large part of our success at The Garage. We are a small family run business so every dollar counts. When selecting charities to support, we have three qualifications: Local and active in our community, Christian based/Gospel driven and a current client with an established relationship. GKC easily meets these three criteria.